Decorative, strong and easily made, the box joint (also called the finger joint) has become widely popular in recent years as the go-to joint for making ornate boxes of all kinds. Originally designed for a more utilitarian purpose, a few industries still make use of this joint to provide strong and attractive storage for their products. These boxes often outlast the tools that came in them. 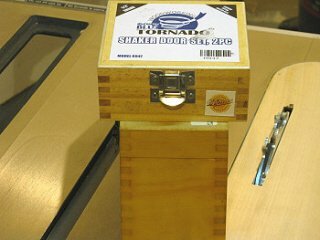 Many tool manufacturers still use box joints to make storage boxes for their products. I prefer these to the cheap plastic cases that are so prevalent today. Unlike many woodworking joints that are either naturally or intentionally hidden from view, box joints are meant to be seen. And for many woodworkers, this provides fertile grounds for the imagination to flourish. Besides making small decorative boxes, finger joints are suitable for many other projects. Drawers, tool boxes, chests and other furniture are all commonly made with this woodworking joint. Fingers can be cut into the edge of a workpiece and joined to an end to form a face frame for a cabinet, picture frame or other frames of this nature. Different species of wood with contrasting colors can be used to highlight the joint. The possibilities are truly limited only by the imagination. Probably all of us can agree that well made box joints are an attractive addition to many projects. The end grain alternating with the long grain adds an almost rustic feel to the finished piece. The generous gluing area provided by the interlocking fingers gives the finger joint it's strength. The orientation of the grain is all long grain which gives the glue superior holding power. The mechanical properties of the joint are excellent and can be compared to the dovetail joint, although it lacks the dovetail's self-locking pin shape. Therefore, the joint relies on glue to keep the fingers from separating. Looking at the photo on the left, you can see the large surface area the interlocking fingers provide and when you take into account that it's all end grain being glued, you can see why this is such a strong joint. To take full advantage of it's properties, the joint should fit nicely together without any gaps between the fingers. Too tight isn't any good either, as the glue will get squeezed out when assembling the joint. A few light taps with a mallet should be all it takes to assemble the joint. 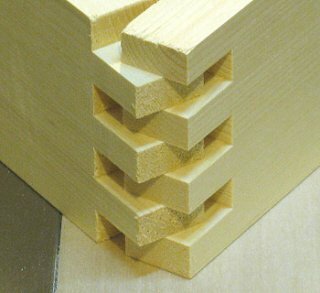 Before modern power tools came along, box joints were cut entirely by hand. Today, most woodworkers use a box joint jig set up on a table saw or router table to produce them faster, and when the jig is properly dialed in, more accurately. With a simple jig, box joints can be accurately cut using the table saw or router. They can also be cut using a dovetail jig equipped with the proper template. The templates are readily available in the most common sizes of 1/4", 3/8" and 1/2". Freud makes a special < a="</a" onclick="return FIX.track(this);"> box joint blade set	made exclusively for cutting finger joints on the table saw. It comes with instructions for building a jig. Most shop made jigs use an indexing pin to align the stock and space the fingers. Once the first finger is formed, the slot left by the cut straddles a pin of the same width and correctly spaces the next cut. This process is continued to the end of the board. A few enterprising woodworkers have built jigs that use a screw advance to move the stock along to the next cut and eliminate the index pin altogether. Each turn of the screw advances the stock a given distance, making this type of jig very accurate. Although the width of the fingers depends mainly on the personal tastes of each woodworker, a good rule of thumb is to keep them at 1/2 the material thickness or less. On narrower workpieces, the fingers should be made narrow enough to cut at least three fingers on one board and two on the other. 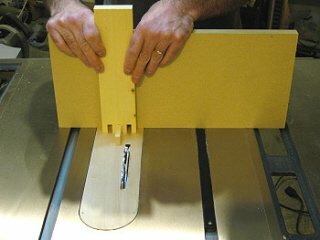 Making box joints on the table saw - a step by step article.